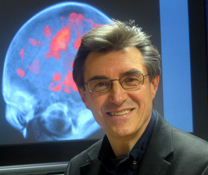 PITTSBURGH—Carnegie Mellon University's Marcel Just — a leading neuroscientist who focuses on how language comprehension and problem-solving emerges from brain processes — has been selected to receive the Society for Text and Discourse Distinguished Scientific Contribution Award. The society's most prestigious award is given to honor scholars who make outstanding scientific contributions to the study of discourse processing and text analysis, and to recognize excellence in research, mentoring and advancements to the field. Previous award winners include the University of Colorado's Walter Kintsch, Stanford University's Herb Clark and the University of Glasgow's Tony Sanford and Simon Garrod. "Marcel Just has made significant advancements towards our understanding of how the brain processes information," said Jane Oakhill, chair of the award committee. Just, the D.O. Hebb Professor of Psychology within Carnegie Mellon's Dietrich College of Humanities and Social Sciences and director of the university's Center for Cognitive Brain Imaging, will receive the award at the society's annual meeting in Montreal, July 10-12. On Wednesday, July 11, Just, a Montreal native, will give a keynote lecture on "Changing Brains for Changing Times." In the talk, he will discuss how brain capabilities have been changed as a result of cultural, educational, work-habit and epigenetic influences and how these brain-imaging findings foreshadow possibilities for shaping the brains of the future. "Marcel Just is enormously deserving of this award," said John Lehoczky, dean of the Dietrich College. "It underscores the value that his research has had to cognitive science and psycholinguistics and its impact on important societal issues such as autism and dyslexia. I expect that he will continue to have a major impact on these fields for many years to come." A pioneer in psycholinguistic research, Just has consistently used cutting-edge technologies to understand reading comprehension in healthy individuals as well as individuals with autism and dyslexia and forms of brain damage. He originated the use of eye-tracking in studying reading research and was one of the first scientists to use functional magnetic resonance imaging (fMRI) to investigate the neural basis of reading comprehension. Just's seminal 1992 research on working memory constraints on comprehension has since influenced a generation of discourse researchers. His Cortical Collaborative Capacity-Constrained Activation-based Production Systems (4CAPS) family of cognitive architectures has served as a foundation for building models of language comprehension, mental imagery, fluid intelligence, problem-solving and dual-tasking. As a whole, his body of research highlights the continuity between language comprehension and other complex forms of cognition. Currently, Just continues to use fMRI brain imaging to understand how brain processes underpin various kinds of human thought, specifically in the areas of autism, dyslexia and multi-tasking. Additional groundbreaking discoveries include identifying the "team play" among brain areas — a theory that explains how the brain compensates for damage from injuries such as stroke by recruiting back-up players; demonstrating that the white matter in the brains of children who are poor readers can be changed and their reading improved through reading remediation; and predicting autistic brain activity and behavior with his "Frontal-Posterior Underconnectivity Theory of Autism." Additionally, Just and his CMU colleague Tom Mitchell applied machine-learning computational techniques to brain imaging data to identify the contents of an individual's thoughts of concrete objects. This allowed them, for the first time, to read the minds of people in a brain scanner, thus establishing the new field of neurosemantics. Just's pivotal and instrumental work has helped to establish Carnegie Mellon as a world leader in brain sciences. The university has launched a Brain, Mind and Learning initiative to build from the research excellence in psychology, computer science and computation to continue to solve real-world problems. For more information on Just, visit http://www.ccbi.cmu.edu/. Pictured above is Just, the D.O. Hebb Professor of Psychology within Carnegie Mellon's Dietrich College of Humanities and Social Sciences and director of the university's Center for Cognitive Brain Imaging.